Enjoy a cold one, Mount Kisco! TGIF and raise your glass because today, Friday, September 28, is National Drink A Beer Day! 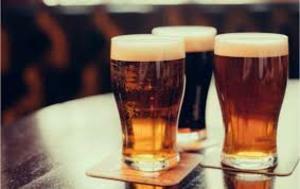 A recent report by 247WallStreet indicates that beer drinking among Connecticut residents has dwindled as of late. Come on Connecticut! We’re ranked #49 of #50 for beer drinking, consuming 20.7 gallons of beer annually. That might seem like a lot, but not in comparison to New Hampshire which placed first by consuming 40.6 gallons of beer annually! In the past decade, local breweries have been popping up all over Connecticut and around Mount Kisco. The State of Connecticut coined the phrase “The Connecticut Beer Trail” to highlight the many beer destinations. According to Connecticut Brewers Guild, promoters of Connecticut breweries, as of September 2018, there are 80 operational breweries (with many more on the horizon). Enjoy a cold one while taking in the magnificent colors of fall in New England. Of course, safety first - before hitting the trail (beer trail) name a designated driver. For more information check out Connecticut Breweries here.